The New South Wales Government has released planned road upgrades around Sydney Airport that will affect congestion on the route to Port Botany. Congestion and restrictions, centred particularly on General Holmes Drive, has been a source of frustration for port-related trucking. It is unclear what help the upgrades that include the WestConnex Enabling Works will provide to trucking precisely on these concerns have but they aim to have other logistics impacts. The works will encompass widening Joyce Drive and between O’Riordan Street and Mill Pond Road to three General Holmes Drive lanes in each direction and widening Marsh Street. Supporting future growth and access to the airport will be improvements to the Mill Pond Road intersections with General Holmes Drive and Botany Road, the Government says. 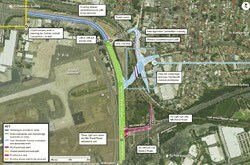 Boosting rail freight movement and access to the airport, Mascot and the eastern suburbs is to be provided by the replacement of the General Holmes Drive rail level crossing with a road underpass that links General Holmes Drive, Botany Road and Wentworth Avenue. "Our package of works including the WestConnex Enabling Works will minimise congestion through the provision of direct and improved access to and from the new motorway from the airport and port precincts," Roads Minister Duncan Gay says. "The Enabling Works are already full steam ahead, with community consultation and pre-construction work such as geotechnical drilling already underway. "The Marsh Street widening is on track to start mid-next year pending project approval and construction on the Enabling Works is planned to start a year later." The cost is $282 million in road projects around the airport precinct, including $40 million from the Federal Government, for WestConnex Enabling Works and other projects to address pinch points. While off-airport precinct comment was sought last year, the on-precinct upgrades deadline is September 22.